The Belarusian authorities are putting all their energy into combating the deepening economic crisis. They have released corrupt officials sentenced to prison terms and appointed them to manage bankrupt state enterprises. The government is seeking solutions to the problem of the growing black market for alcohol, which brings huge losses to a lucrative state-owned business. Externally, the authorities are negotiating a new gas rebate from Russia and trying to find a place for Belarus in the Chinese New Silk Road project. Lukashenka appoints officials charged with corruption to manage desperate enterprises. Belarus Segodnya discusses Lukashenka's recent decision to release corrupt officials from prison and appoint them to head up and save desperate state enterprises. The newspaper says that a state manager who committed an offence should not be lost from society. The author draws comparisons with the Stalin era, when repressed officials were given a chance to prove their devotion to the state. These officials’ experience and skills can be used for the benefit of the people. The author also gives a few counter arguments: not all offenders receive this chance, it can damage the fight against corruption, it can be an example of corrupt ties within the elite, and become good material for the opposition to criticise the authorities. Belarus wants to a place on China’s New Silk Road. Belarus Segodnya quotes Lukashenka’s interview with China Central Television. “We expect the most serious investments here in Belarus, we need to create companies that will produce a new generation of commodities. Belarus is well suited for this purpose – it has an extensive infrastructure and can transport goods in all directions, to the EU and the Eurasian Union. The project is open for investors from all over the world, and it is not built against somebody's interests. The project should unite economies and trade, and later also cultures and people”. Belarus is attempting to find its niche in the New Silk Road projects and is currently developing an industrial park called Great Stone jointly with China. Belarus condemns commemoration of Polish fighters guilty of the genocide of ethnic Belarusians. Respublika criticises the decision of the Polish authorities to allow a nationalist march in borderland Hajnaŭka which has a significant Belarusian population. The march commemorated the Polish fighters who struggled with the establishment of communist rule in Poland after World War II. Many of their activities were aimed at ethnic Belarusians who were regarded as supporters of communism. A squad under command of Romuald “Bury” Rais committed mass killing of the local Orthodox population in 1945-1948. The paper says that Poland has the right to interpret history and form its own state ideology, but glorification of mass killing is unacceptable and the Belarusian authorities should support the local Belarusian minority to preserve its traditions and identity. Minsk wants a rebate on Russian gas price. 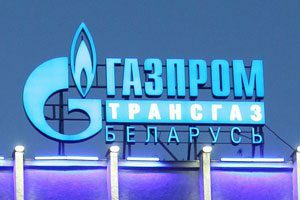 Soyuznoye Veche reports on the negotiations between Belarus and Russia on the gas price discount. At the moment Belarus enjoys the lowest gas price among all importers of this Russian resource, but Minsk expects yet another rebate of $10 per 1,000m3. Deputy Prime Minister Uladzimir Siamaška says that a new discount will help to reduce tariffs on energy for the production sector of the Belarusian economy. At the moment Belarusian producers work in unequal conditions with their Russian counterparts, and hence cannot compete on the single market of the Eurasian Economic Union. The authorities fight with the shadow alcohol market. The number of offences related to illegal alcohol trafficking increased 4.5 times in 2015, Respublika reports. In total police confiscated around 700,000 litres of illicit alcohol. However, this represents only a small part of the market, which the Ministry of the Interior estimates to total 50m litres. Virtually all traffic comes to Belarus from Russia, as the countries have no customs control between them. The author claims that recent measures to restrict alcohol consumption have only driven it underground. To tackle the problem, he suggests removing restrictions and cutting the price in order to minimise the price gap between legal and illegal alcohol. He also speaks in favour of the internet trade in alcohol – a step which the Ministry of the Interior recently called a “diabolical idea”. Women dominate in the state bureaucracy, but only at mid and low levels. Zviazda newspaper publishes statistics on Belarusian women dedicated to International Women’s Day. Women make up 53.5 per cent of Belarus' population, and 78 per cent of women live in urban areas, with an average age of 42 years. 23 per cent of them work in industry, 18 per cent in education, 14 per cent in trade, 13 per cent in healthcare and social services, and 8 per cent in agriculture and forestry. 30 per cent of women have higher education and 42 per cent professional education. 35 per cent of females are unemployed, and they earn 23 per cent less than males on average. Women occupy 30 per cent of seats in parliament, 56 per cent in local executive and self-government bodies and account for 70 per cent of all civil servants. A new presidential edict outlaws treasure hunting. Narodnaya Gazeta discusses illegal treasure hunting and the new edict No. 485 targeting this problem. The edict bans unsanctioned searching for, selling and buying of archaeological objects. Earlier the police only showed interest in those digging up old weapons and ammunition. According to the law on protection of cultural heritage, the finder of treasure gets only 25 per cent of its value, the rest going to the state. Archaeologist from national academy of sciences Vadzim Košman says the edict should have been introduced 15 years ago. During this period many high-tech devices appeared on the market and a great deal of treasure was dug up, before disappearing. When looking through internet forums dedicated to treasure hunting, Košman is often shocked by the unique findings which may be forever lost from science. However, many amateurs say the edict is unfair. It should punish vandals who destroy burials, and not people walking in the fields with metal detectors. StudWatch initiative launches a #DanceForReforms flashmob. Viasna publishes a report on monitoring detention facilities in Belarus. 106 new NGOs were registered in 2015. Three Belarusian crowdfunding platforms collect nearly $140K of local funds in 2015. Belarus in Focus announces winners of its annual international journalism competition. Lawtrend presents infographics of 48 government websites. Ministry of Interior confirms "no detention, fines later” as new tactic on protest rallies. Two independent websites receive warnings from the Information Ministry. Belarusian Christian Democracy Party denied registration for the sixth time. Since the presidential elections fines for civic activists and journalists grow, but arrests drop to zero. StudWatch launches a flashmob #danceForReforms. StudWatch initiative is a number of student CSOs that united to jointly uphold the quality of higher education and achieve true student self-government. The initiative calls on students who are dissatisfied with the status quo in Belarusian higher education, to take part in the flashmob – to dance on the background of the university, record a video and post it in social networks with the hashtag #danceForReforms. Viasna publishes report on monitoring places of detention in Belarus. The Human Rights Center Viasna has analyzed the situation in places of detention in Belarus and prepared a report on the results of monitoring in 2015. The report states that the situation in places of detention did not considerably change last year and describes cases of violating human rights, using or encouraging cruel, inhuman and degrading treatment. Statistics on the registration of NGOs. In 2015, 106 new NGOs were registered in Belarus, which increased the number of registered organizations by 2.7% compared to 2014. Thus, now in Belarus there are 2,665 registered NGOs, 34 unions (associations) of NGOs, 164 foundations, and 7 republican state-public associations. More than 3 billion rubles collected at Belarusian crowdfunding platforms in 2015. They are MaeSens.by, Ulej.by and Talaka.by. The total amount is around $140K (on the recent exchange rate). According to Ulej.by, the average donation is $23-25. People respond more actively on social projects like support to children, disabled, inclusive education systems, and animals. "Executive Authority Online" infographics. Lawtrend presents the results of a recent study of 48 official websites in a format of interactive infographics. The infographics reflects changes of the official websites since 2013, when for the first time Lawtrend conducted monitoring of the official resources of national executive authorities (general rating, accessibility for the blind, the changes for two years, etc.). Fines grow, arrests not applied. According to the Human Rights Centre Viasna andBAJ, since the presidential elections to present (October 2015-February 2016), about 90 administrative cases were initiated against civic activists and journalists. More than a half of cases ended up with fines for a total amount of Br320 million (around $17K); no administrative arrests followed. To compare with the same period a year ago (October 2014-February2015) – 70 administrative cases, Br120 million (around $8K) of fines and 151 days of administrative arrests. Also, then six political prisoners remained behind bars. Tell the Truth holds fifth founding congress. On February 21, the civil campaign Tell the Truth! held the fifth founding congress to apply for registration of the association. It was attended by 70 delegates from all regions of the country. Tell the Truth! has been trying to get an official registration since 2011, to no avail. On February 25, the campaign celebrates its sixth anniversary. Belarus in Focus announces winners of the fifth edition of its annual international journalism competition for authors writing about Belarus. This year, the competition received 71 articles by 59 authors from 16 countries. The jury has decided to assign 4 prizes to professional journalists and 1 prize to the beginner. The winners will be awarded at the award-giving ceremony in Minsk in the end of April. Entrepreneurs’ protests continue. On February 28, several hundred of private entrepreneurs gathered in Minsk October Square, trying to make the government abolish decree #222. No one was detained. Anatoli Shumchanka, the leader of the Perspektyva, and Mikalai Statkevich, ex-political prisoner announce an Entrepreneurs Marchunder the same slogans for March 14. Interior minister explains why police go easy on opposition rallies. Recently, the police stopped dispersing mass rallies and detaining their participants – now they draw protocols and impose fines. 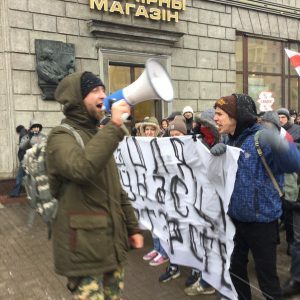 Thus, the Belarusian police found a new suitable algorithm for responding to opposition rallies, which satisfied both the authorities and the West. The monthly Human Rights Monitoring for February confirms that all unauthorized peaceful assemblies within a month passed without the intervention of law enforcement authorities. Two websites warned by the Information Ministry. Two independent websites, of Nasha Niva newspaper nn.by and Ezhednevnik ej.by received written warnings from the Ministry of Information. The chairperson of BAJ Andrei Bastunets underlines that a warning is not a preventive measure, but a sanction – two warnings can result in a closure of the mass media. Belarusian Christian Democracy Party failed to register for the sixth time. The Ministry of Justice has found ‘rude violations of the legislation of Belarus’ in the statutes. The last constituent assembly of the BCD was held in December 2015. BAJ leader takes part in Editors’ Club. The program Editors’ Club is broadcast on the Belarusian State Television Company and gathers for a discussion chief editors of state-run editions. After the appeal of key independent media, the Club invited Andrei Bastunets, head of Belarusian Association of Journalists, to the program on February 25.